When the Chicago Cubs and the Cleveland Indians face off in the opening game of the World Series on Tuesday night, there's a strong chance you're gonna need something to help soak up all the beer you'll be drinking. Thankfully, Chipotle may have that base covered for you with a special "Believe & Achieve" deals for free burritos to help fans of both teams celebrate the first game. Chicago Cubs fans can score a special buy-one-get-one (BOGO) deal good for a free burrito, burrito bowl, order of tacos, or a salad just for showing up to participating locations in Chicago, Northwest Indiana, or Davenport, Iowa, while wearing Cubs team gear on Tuesday, October 25th. With that said, the deal is only good for food you order at a physical restaurant (among a few other restrictions), according to Chipotle's website. Your stomach will be flying the W in no time, if you choose your entrees wisely. If you're rooting for the Cleveland Indians, you'll get the same BOGO entree deal if you show up sporting your Tribe gear at participating Chipotle restaurants in Cleveland and the Akron area on Tuesday. The Cleveland deal, however, is limited to the hours of 4pm to 10pm in addition to in-restaurant ordering restriction, according to Chipotle's official page for the promotion. 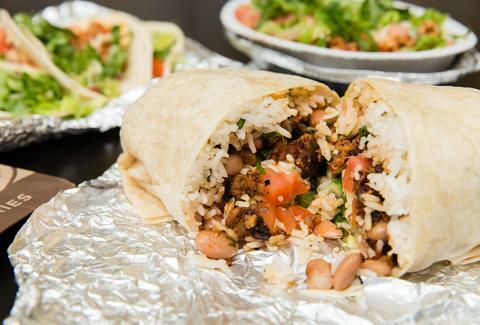 You'll just have to make a quick burrito detour on your first beer run. The aforementioned deals are sadly limited to the teams' home cities, but a separate Chipotle BOGO promotion means you can get your hands on free burritos across the country -- and you don't even have to like baseball. On top of that, the company also plans to sell $3 burritos on Halloween, in case you needed to stuff yourself with even more Chipotle this month. Oh, and speaking of free Mexican-inspired fast food, don't forget to look out for the first stolen base of the Series. Tony Merevick is Cities News Editor at Thrillist and has long believed that everything tastes better when it's free. Also, go Cubbies! Send news tips to news@thrillist.com and follow him on Twitter @tonymerevick.